It may just be selective memory but, based on snippets of conversations with the Rocks brewing team over the past couple of years, it seemed like they’ve long been looking to add some sort of a highly hopped but low ABV session beer to their range. For example, going back a couple of years, they packaged an India Session Ale but even that, at 4.7 percent ABV, still felt like it was at the relatively high end of the spectrum and didn't quite nail the idea in full. But, just a couple of months ago, they quietly released a new, draught only, mid strength pale ale under their limited edition Conviction Series. The beer quickly proved popular enough that they’ve made the call to roll it out in earnest – and in cans too. 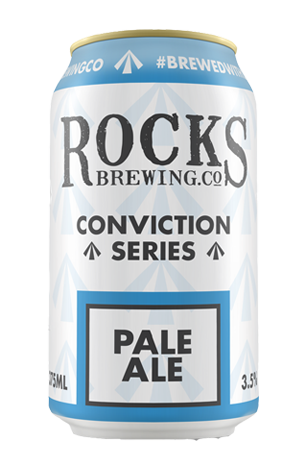 At just 3.5 percent ABV, the Conviction Series Pale Ale is a bona fide mid strength but it doesn't shirk away in the flavour department. On that front you can expect something with depth and grit rather than a beer that’s light and fruity; on the nose you get hints of capsicum while on the palate the robust bitterness certainly lets you know it’s there. Were you to not be made aware of the ABV before taking a sip you're unlikely to know that it’s a light beer, and that means it could well prove a popular drop this summer with people who want to feel like they’ve had a beer with substance but still want to able to drive home after the experience.